Parliament was also one of the first creators to introduce into mainstream pop culture the narrative that aliens jump-started Egyptian, and by extension African, civilization. Many had been captivated by Erich von Däniken’s 1968 book, Chariot of the Gods, but P-Funk took the idea further and pushed a more Afrocentric agenda than Däniken. Aliens and alienation are key features of Afrofuturism. [Pedro] Bell’s aliens were not alienated from their place in the world. Funk offered the promise of feeling at peace with the universe; a condition that often eludes African Americans. Her second post considers "transportation—especially ships—as both a danger, and a vehicle for escape from danger." [Bell's] Dali-esque cover for Standing on the Verge of Getting On features an actual chariot, manned by a Greek hero ready to fight space aliens. 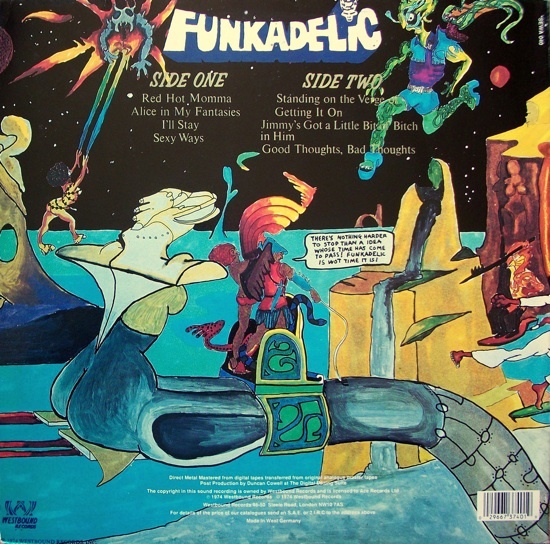 There’s even a detailed rendering of a Space Needle on the cover of Tales of Kidd Funkedelic.